Image by lil moe72 via FlickrOne of the easiest ways to support Pittsburgh is to spend your money locally. One of my hopes for this blog is to connect more people to the local businesses here in Pittsburgh. With the start of the holiday season, I can’t believe it is already the holiday season – I tried to ignore the robotic Santa Claus that started singing at Costco before Halloween was even here. But after stopping by the Shady Side Presbyterian Church Bazaar last weekend, I can no longer pretend that the Holiday Shopping Season is weeks away. I know that holiday spending is down this year, but that makes it even more important to support the businesses that continue to do good things for the Pittsburgh community. Click here to check out the ShopPGH category and read about some of the other Pittsburgh businesses. We will also be featuring more ways to ShopPGH this season with a holiday gift guide look for the tag Holiday08. Have a Pittsburgh gift to suggest? 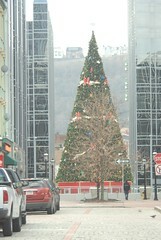 Where do you like to shop PGH for the holidays? Please leave a comment here or send an email to info@iheartpgh.com.